Hello everyone, and welcome back to The Arcane Sanctum. 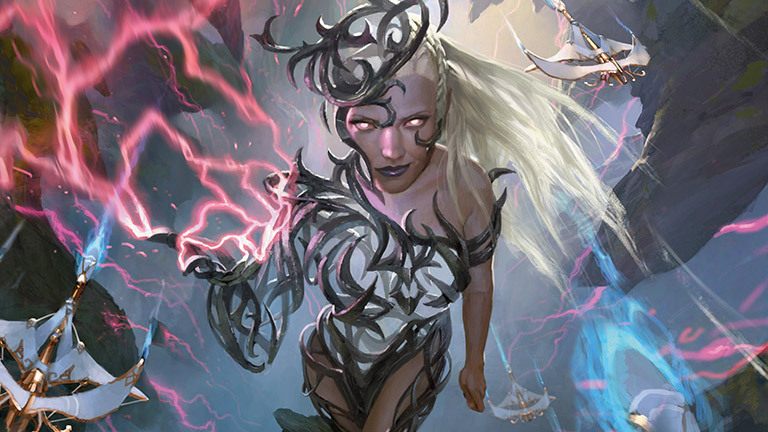 Since starting this page I have spoken about many different types of decks, but all of them have been in non-EDH formats (even the casual decks). I have been wanting to write about this format for awhile, and I want to learn more about it. To learn from that let’s discuss my history with this format. About 5 years ago I finally built my first EDH deck with Kaalia. The fact I could cheat big creatures into play, and have them attacking, was very appealing. I was even taking the deck to play after my round of Standard was over (which caused judges to do a double take as they walked by). The store I attended regularly had EDH run before, in-between rounds, and well after their weekend Standard tournaments were over. Sometimes the pods would be with 4 players, sometimes 6, and sometimes even with the Planechase planar cards as well (those were a blast). Unfortunately things with that group came to an end, and I didn’t know many people into EDH. I started peeling off some cards, and put getting back into it on the back burning. I had built a second deck, Grand Arbiter Augustin IV, however when I was moving cards I kept a few from that deck to eventually build Legacy Miracles (which happened about 4 years ago). I’m going to get straight to the point here: Combo, combo, combo. …and that’s not all of them. I’m not a combo player at heart, but seeing the potential not only in the format, but for this General opened my eyes quite a bit with what could be done (and done for fun). With all of that said the deck could still win in traditional ways with all of the value that can be generated by the deck. Simply equipping a Cranial Plating to a big creature is often more than what another player may be able to handle. I’m sure through changes I could add more combos, or make the existing ones even better. Cataclysmic Gearhulk may seem odd, but with a sac outlet I could get extra mana from the sacrificed artifacts, and then cast Open the Vaults to get them back to keep going. With Panharmonicon I can cast 2 instants from my year, or kill 2 creatures. Seems solid. Honestly Phyrexian Rebirth may not cut it. One removal spell and my X/X horror is gone. Some of these options may be better, and even adding Merciless Eviction could also help vs Enchantments. The deck does seem to be lacking in counter magic. Stoic Rebuttal fits the theme of the deck, and other counterspells like Absorb, and Undermine could also be in the deck as well. I initially had these in, but then removed them. I should have left them in. Adding other non-ABUR dual lands would also help these out (looking at you Battle For Zendikar, and Amonkhet duals). The one thing I have noticed is that lands should be producing a color more often than not. Space is limited for utility colorless lands, and getting that crucial 4th color will help a lot. You can of course use what you wish, but her story takes her from Esper, to Grixis, and even Jund if I remember correctly. I wanted to highlight that in a way with the land choices. Next Speaking Casually: Take Flight With Esper Dragons.